Super Bowl Sunday is coming up, and I'm hoping to see some amazing moves and touchdowns. But, I bet none will surpass the sight of a dog catching a football in his mouth like in Disney's new re-release of the movie, Air Bud: Golden Receiver Special Edition , available in stores starting today (February 2, 2010). That athletic golden retriever, Buddy, can really catch and play the game of football. He even has his own victory dance - a roll in the grass on his back, legs in the air. I dare an NFL star to try that on the big day. 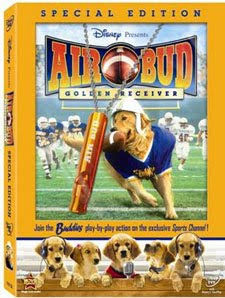 I had previously seen the original Air Bud movie with basketball playing dog, but somehow I missed this family friendly football sequel, first released in 1998. In Air Bud: Golden Receiver , Buddy the dog and his human pal, Josh, resume their ball playing for the Fernfield Timberwolves. Eighth-grader Josh becomes annoyed when his mom starts dating Buddy's veterinarian. Even though Josh doesn't show interest in football, he decides to sign up for the school team to distance himself from having to watch the budding lovey-dovey relationship unfold. By accident, Buddy shows up at a game and starts playing football along with his owner. The losing team takes off with Buddy's help and they end up in the state playoffs. Unfortunately, Buddy has attracted the attention of two Russians that hope to make him the star attraction in their circus. They try to dog nap the canine wonder and put the team's winning season in jeopardy. Buddy is a fun dog to watch perform on screen and seeing him all suited up in a helmet, pads and uniform gets you in the football mood. Josh's struggle to accept a new father figure in his life is fairly well played out in several moving scenes. However, the over-the-top Russian characters, Popvov and Natayla, reminded me of the goons seen in the Home Alone or Beethoven movies. The kids laughed at all their ridiculous antics, but it was all a bit too silly for me. It seems the slapstick comedy appeals to kids, though, so younger audiences will enjoy the film, especially those interested in sports and dogs and the other Buddy movies. And I can't help but wonder if Buddy catches an actual football, or a specially designed "dog-friendly" one. We love the buddies! This might have to go in the netflix queue.